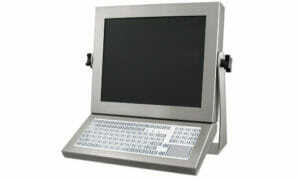 The stainless steel version of this keyboard is ideal for food and pharmaceutical applications. The flat polyester surface makes it easy to clean and has no nooks or crannies where undesirable materials tend to collect. New User-Friendly Key Switches eliminate the frustrating mistakes normally associated with membrane keyboards! If you have used membrane keyboards, you have no doubt been frustrated from making so many mistakes. That’s because it wasn’t until you saw the end result of what you had done that you could ever really know if you pressed a key in the right place or pushed on it hard enough or long enough. Our key switches increase your accuracy dramatically because they allow you to type not just by sight, but also by touch. Each key is embossed on all four sides so that you can feel the precise outline of the area you should depress. The middle of each key is elevated (domed) ever so slightly so that you can feel the exact middle of the switch location under the membrane. Finally, when you depress the key, you can feel the switch activate, indicating you positively closed the switch.